Global population growth is putting severe pressure on agricultural production, since food supplies need to increase by 50–70% to meet expected future demands. Arable land that is used to grow crops for food is in short supply, and freshwater is being depleted. One way to increase production is to utilize marginal land and water resources such as coastal desert areas and seawater. 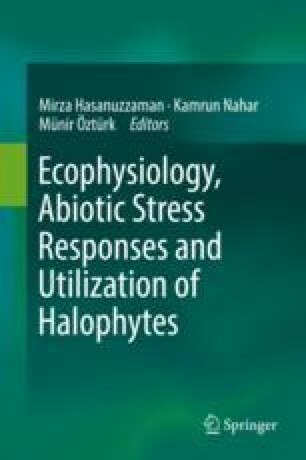 Aquaculture effluents enriched in nutrients can be utilized to irrigate highly salt-tolerant plants such as halophytes which constitute the best candidates for the development of biosaline agriculture. Among the halophytic crops that have high potential to be grown with seawater and can be economically viable are mangroves and Salicornia species. In particular, Salicornia bigelovii (dwarf glasswort) is a halophyte that grows in salty water and can be utilized in multiple ways. Since 2015, a seawater-based system has been implemented in a coastal desert area in Umm Al Quwain in the United Arab Emirates, exploring the growth potential of four high-yielding S. bigelovii genotypes using four saline water treatments (seawater; canal water which is the drainage water coming from a marine research station that flows into a mangrove area; and aquaculture effluents from tilapia and sherry farming) and two types of irrigation system: bubblers and open pipes. A multidisciplinary study was conducted to examine several soil and water attributes, various growth parameters of S. bigelovii genotypes, the seed oil content, and the profitability of the system. Results showed that by selecting the suitable S. bigelovii germplasm combined with appropriate water and soil management practices, proper growth of salicornia plantation could be achieved in a coastal desert ecosystem. However, continuous exploration of the long-term environmental impact of implementing saline water resources and improvement of the economic sustainability of such biosaline production systems are needed.